Yesterday, I posted another of my famous articles questioning the intellectual honesty of atheists. Naturally, I took some heat for it. And that's a good thing. The problem is, the flak that I received helped prove my points! But first, I was asked a question: "Do you believe all atheists fall into those categories?" Nope. Do you think I'm stupid enough to try to box a group of people and a complex issue into just five areas? As I explained in that article, I have had my own experiences, plus reading, hearing interviews and having discussions with others regarding atheists, the whole thing was fresh in my mind. One guy lashed out at me on Twitter. He wears "atheist" in his name as a badge of honor, and it appears that his whole purpose in Twitter is to bash Christians and the Bible. Some of his comments were so amazingly vapid and caustic, I wonder if he (and some others) are deliberately stupid! In yesterday's article, I was using atheism as my primary illustration for a greater principle that I was trying to get across. Namely, that people will join a cause because others are doing it. That's a bad motive for something important. Another thing that is fresh in my mind is the intellectual dishonesty of most of the atheists that I encounter, and I wanted to emphasize that as well. Since atheists stirred me up, I'm going to focus on a bigger problem that they have: Pride. Yes, you heard me. They do not want to admit that God might be real after all. That would mean admitting that they were wrong. Worse, atheists would have to do something about it. And I really believe that they are afraid of becoming like Josh McDowell, Lee Strobel and others who set out to disprove the Bible and, when confronted with the truth, became Christians! By the way, this is a blog, not a series of doctoral dissertations. I try to keep them short because I want to entertain my readers as well as inform, capice? There is something that atheists need to learn about Christians. We do not present our case with the attitude of Victorian gentlemen discussing Parliament in the club, intellectualizing and saying, "How droll, yes, quite". Rather, we are compelled by a greater motive, that we are concerned that you are on your way to a very unpleasant eternal destination. You could end up in Hell because you don't want to admit that Christians are right after all. Imagine...missing out on eternal life because of silly pride. I've been going through a science fiction book that describes a group of people that want to improve the world by improving humans. To do that, they want to eliminate emotions and everything else, leaving just intellect. But humanity is not built that way! When it comes to discussing the Bible, atheists want humans to be pure intellect. That is ridiculous. Tell me, Mr. Atheist, when your vehicle gets damaged, do you simply say, "I cannot have emotion. Anger is simply a biochemical reaction..." Of course you don't. Most of us believe that people are body, soul (or mind) and spirit. Yes, the distinctions get blurred. My point is that it is ridiculous to cut out part of the essence of your being. That is why I am saying to you now to listen to your heart. Think about what Jesus said. Click here if you want to honestly read a Gospel presentation. See the video (below) for comments about what happens after we die (are you ready for that?). About a year ago, I wrote a post about bandwagon convictions. That is, if your values and inner convictions are based on doing the popular thing, they are not worth a great deal. I felt that it was time to try the subject again. 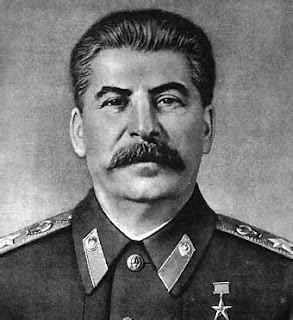 That is comrade Stalin in the picture. He was an atheist leader of the failed Soviet Union and killed millions of his own people. I am using atheists for my main example because I have had many dealings with them. Also, I have listened to debates with them, where they act like children who have just been told that they cannot have candy before supper. Agonizing. Similarly, I know someone who is opposed to the recent Arizona immigration law. It suddenly occurred to me, "Of course! She is dating someone from south of the border. Naturally, she will form her viewpoints to please him." If she actually looked at the evidence of the damage that illegals are doing to the economy and to safety, she would probably change her mind. People make decisions because "Oprah said so". I don't care what she says, believes, recommends. If someone is doing things to please her, or someone else on TV, they are loony. News flash, Skippy: Oprah doesn't care, or even know, what you do. She won't pay your bills or die to save you. Why should she? Time to get real. Back when B. Hussein Obama was elected, many people voted for "the (half) black guy" for the novelty, and also because they believed the leftist propaganda. Look at the damage being done to the country by their stupidity! I know people who "have their religion", but do not really know anything about the Bible and Jesus Christ. They are content to do whatever it is they do that passes for their religion, but do not wish to possibly make a change because they would have to explain themselves to friends and family. It is a dangerous thing to go with a herd mentality or be trendy. It is bad enough to spend money on trendy clothing or music, but to vote in ways that affect the nation, or to gamble with your eternal destiny... not worth it. I'm asking you to think before you act. Get information before you make your final decision. Don't follow the herd and be a mindless sheep. This video from the 1980s by the great DeGarmo and Key band is startling in several ways, not the least of which is the change in technology between then and now (dot matrix printer, 5-1/4 inch floppy disks, Apple computer, etc.). Also, if you're familiar with videos like ZZ Top's "Sharp Dressed Man", you'll notice a similarity in the production style. I can't prove it, and spent a lot of time trying to do just that, but if memory serves, a producer and/or director of ZZ Top material was involved in making DeGarmo and Key's "Six Six Six". If you can't see the video, it is also embedded at the mirror posting. Addendum: Google fouled up a bit, some of the sound is muddled here. I suggest the other version at the mirror site. Buon giorno. No, I'm not filing for separation from anyone. This "separation" thing is the alleged "separation of church and state". What I have to say seems contradictory at first glance, so I have to lay some groundwork. While listening to a debate between apologetics expert Matt Slick at CARM (any relation to John Slick who played keyboards for Petra, Matt? Addendum: "No", he told me.) and an atheist he had to take a position that seemed contradictory to the atheist. (But that's typical of atheists, they want things their way, and do word games so they can play "gotcha!") The question was whether or not atheism is intellectually feasible. The "Infidel Guy" was obviously squirming and getting antagonistic, so he tried to box Mr. Slick in because he would not give a standard "yes or no" response. But to give that kind of response would have been dishonest. Yes, it's feasible only on the same level as pink unicorns are feasible; his "yes" was qualified. When explored further, we see that atheism is intellectually absurd. After all, they really have no philosophy, they simply attack the Bible and belief in God. In another broadcast, Matt had an expert on in American history, William Federer. He pointed out that all state constitutions mention God, and that many actually had taxes to support religion. Also, it was originally mandatory to declare that you believed in God in order to hold public office. "Do you have a point to all this, Cowboy Bob?" Funny you should ask that, just when I'm getting to the point. Do I believe in the separation of church and state? No — and yes. The "no" part is the constitution: "The church shall be separate from the state, and the school from the church". Yep, it's right there! Problem is, this is not a quote from the American Constitution. Look up the USSR constitution, or click here. There is no "separation" in the "establishment" clause in the US Constitution. Here's my "yes" part: You should know that "Congress shall make no law respecting an establishment of religion, or prohibiting the free exercise thereof..." That means, no federal law shall establish a state religion; you can believe or disbelieve what you want to, capice? Not only do I detest the idea of a state-run religion, but I do not want people being forced to proclaim faith when they have none in order to get political power. That's where corruption comes in. When a religious institution is the repository of political power, people will say and do whatever it takes to get that power. Say that you believe in God, Jesus, the Resurrection, whatever, and you can be in the office you're seeking. People who do not believe will say that they do believe. Let me simplify this, I'm getting in too deep. I don't want anyone teaching the Bible to kids in school because he has to, even though he does not believe it. Can you imagine what kind of garbage he can put into their heads? I cannot end this without saying something else, that there is no "freedom from religion" in this imagined "separation" clause. The push by groups like the ACLU or Freedom From Religion to eradicate all expressions of faith from public life is nothing less than the rule of the many by the few. That is tyranny. "As the Supreme Court has stated, "The First Amendment was never intended to insulate our public institutions from any mention of God, the Bible or religion. When such insulation occurs, another religion, such as secular humanism, is effectively established."